Real Friends are celebrating Halloween a couple of days ahead of time with their brand new music video. On Monday (Oct. 29), the Illinois-founded band unleashed the three-and-a-half-minute clip for their latest single, “Me First.” The video finds the five-piece trying to evade a beautiful serial killer who just so happens to be their boss. Sadly, the video concludes with things not turning out in the guys’ favor. The video begins with the antagonist, a beautiful blonde, sitting in her mansion minding her own business. Once the music kicks in, the blonde turns from a subdued rich person to someone with a sinister secret behind her smile. In between the colored images of the blonde going about her house, are black-and-white shots of her in what looks to be a basement, with a cleaver in hand. Unfortunately for the guys in the band, they work for the serial killer and have become her next victims. The rest of the clip follows the killer as she hunts down each of them and beheads them in her basement of secrets. Watch the complete music video for “Me First” above. “Me First” is featured on Real Friends’ recently released record, Composure. The record was released back in July via Fearless Records. Composure is the follow-up to band’s 2016 release, The Home Inside My Head. In support of Composure‘s release, Real Friends previously confirmed plans to hit the road with Boston Manor throughout the end of October and into November. Their upcoming tour will begin on Tuesday, Oct. 30, at the Irenic in San Diego and conclude almost a month alter on Nov. 25 at the House of Blues in Chicago. Real Friends’ tour dates can be found on their website here. This entry was posted in Music News, Music Videos and tagged Composure, Me first, music, music news, music video, new music, Real Friends, tour, tour dates, tour dates 2018. Bookmark the permalink. Real Friends’ new album is just a couple of days away, but the band is giving fans another new song to hold them over until then. On Monday (July 9), the Illinois-founded band released the official third single from their upcoming record, Composure. Titled “Unconditional Love,” the new song can be streamed above. “Unconditional Love” will join previously released tracks “From the Outside” and “Smiling on the Surface” on the group’s third studio album. Composure is due out this Friday, July 13, through Fearless Records. Pre-orders for the new record are still available on the band’s website here. The record was produced by Mike Green whose resume includes The Aces, All Time Low, the Mowgli’s, and Paramore. In a press statement released back in June, bassist Kyle Fasel revealed that the forthcoming ten-track album was the first time the band put a lot of time and effort into not only the individual tracks, but the album as a whole. “We have never put this much time and effort into a record,” begins Fasel. In support of the album’s release, the band is currently playing the final Vans Warped Tour. This entry was posted in Music News, Music Videos and tagged Composure, music, music news, music video, new music, new song, Real Friends. Bookmark the permalink. Earlier this month, Real Friends dropped a brand new song; their first since going on an unofficial, year-long hiatus due to vocalist Dan Lambton’s bipolar diagnosis. On Monday (June 18), the Illinois-founded band confirmed that the new song was not a one-off single, but rather part of an upcoming new record. Titled Composure, the group’s third studio album is due out July 13 through Fearless Records. According to bassist Kyle Fasel, the forthcoming, ten-track album —which was produced by Mike Green— was the first time the band put a lot of effort and time into not only the individual songs, but the album as a whole. In conjunction with the new album announcement, the band also released another new song from Composure; a tune titled “Smiling on the Surface.” Stream the new song above. Prior to the new album announcement, the band had a small group of hometown fans RSVP to three acoustic shows. Instead of playing an acoustic set, the five-piece announced the release of Composure and played the complete album for them. Watch some footage from the surprise sets here. Composure is the follow-up to the band’s 2016 release, The Home Inside My Head. In support of the summertime release, the quintet will embark on the final Vans Warped Tour this summer. For now, the complete track listing for Composure can be seen below. This entry was posted in Music News, Streaming and tagged Composure, music, new music, new song, Real Friends, stream, streaming, tour, tour dates, tour dates 2018, Vans Warped Tour. Bookmark the permalink. Listen/watch the video for “Mess” below which was recorded during their $5 tour earlier this year. The Home Inside My Head is set to be released on May 27 through Fearless Records. In support of the new album, the band is set to perform on the Journey’s Right Foot Stage during this summer’s Vans Warped Tour run. This entry was posted in Music News, Music Videos and tagged Mess, music, music news, music video, Real Friends, The Home Inside My Head. Bookmark the permalink. This year’s installation of The AP Tour is the first in three years. The last trek was back in 2012 and was primarily focused on harder sounding bands like Miss May I and The Ghost Inside. 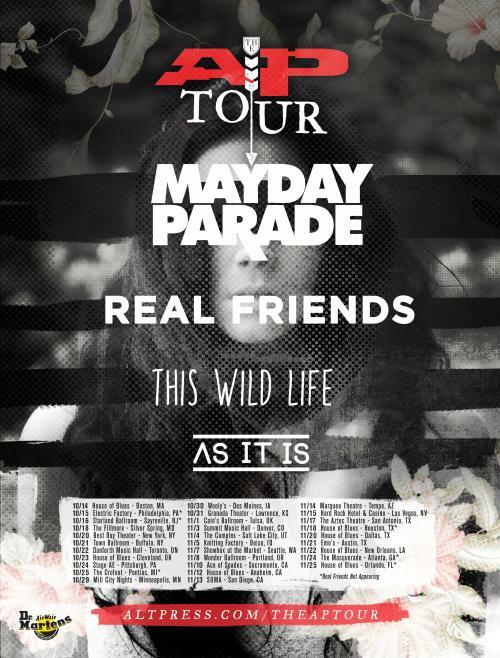 This year’s tour is also the second time Mayday Parade has been featured on the bill. The band first made an appearance on the line-up back in 2009 when they headed out alongside the likes of The Academy Is…, Set Your Goals, The Secret Handshake, and You Me at Six. Heading out alongside the five-piece will be “sad boys” Real Friends, This Wild Life, and As It Is. The 2015 AP Tour will kick off at the House of Blues in Boston on Oct. 14 and wrap up on Nov. 25 at the House of Blues in Orlando. The complete list of tour dates can be seen below. 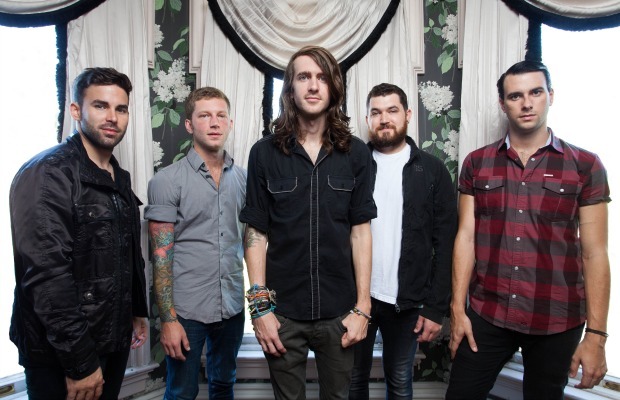 Mayday Parade’s impending new record is set to be released on Oct. 9 through Fearless Records while a snippet of the first single, “Keep In Mind, Transmogrification Is A New Technology,” can be heard here. This entry was posted in Music News and tagged As It It, Black Lines, Mayday Parade, music, music news, Real Friends, The AP Tour, This Wild Life, tour, tour dates. Bookmark the permalink. Just when you thought Skate and Surf Fest had announced all the acts slated to take the stage next month in New Jersey, you find out, they weren’t quite done. Two months after unveiling the so-called “complete” line-up for the weekend-long festival, organizers added a couple of more bands to the already packed line-up. Joining previously announced acts like the Dropkick Murphys, Thrice, Acceptance, Manchester Orchestra and more will be Hit the Lights, Cancer Bats, Diamond youth, No Good News, Souvenirs and lastly, Real Friends. “Skate and Surf has always been a pretty significant event to us,” reveals Real Friends bassist Kyle Fasel. For those who have not been keeping tabs on the lengthy list of bands, the newly revised list can be seen here. 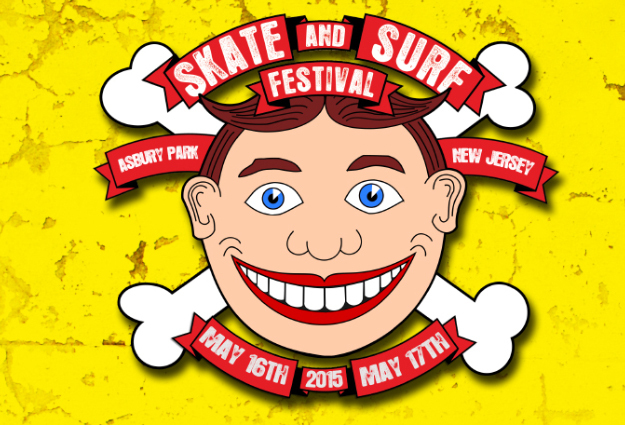 Skate and Surf Fest will return to their home of Asbury Park on May 16 and 17. Tickets are still on sale so you might want to get them if you haven’t yet. 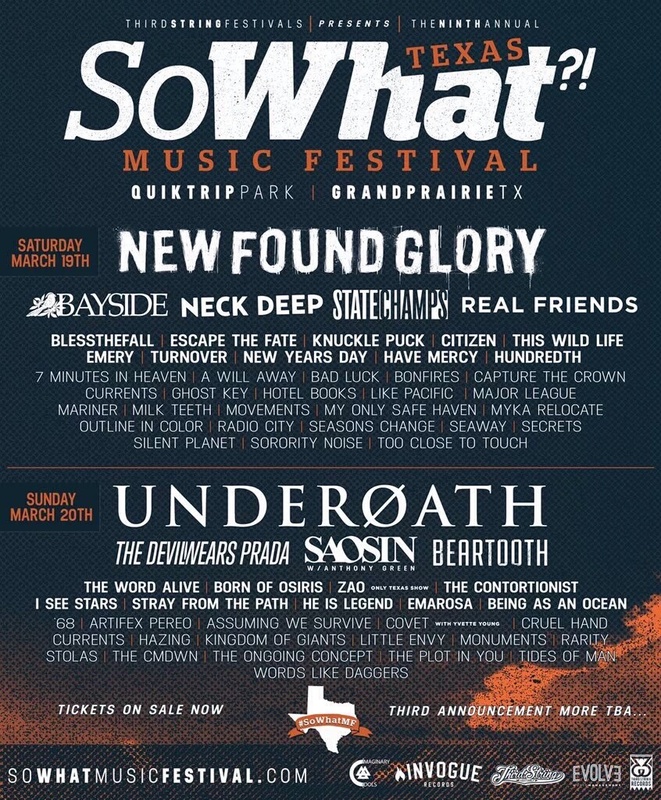 This entry was posted in Music News and tagged 2015, Acceptance, Cancer Bats, Diamond youth, Hit the Lights, line-up, Manchester Orchestra, music, music news, No Good News, Real Friends, Skate and Surf Fest, Souvenirs, the Dropkick Murphys, Thrice. Bookmark the permalink.